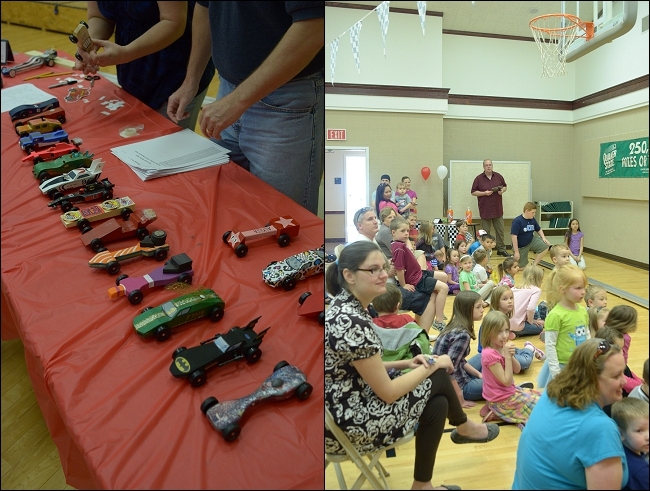 A few weeks ago we put on a Family Pinewood Derby at church. 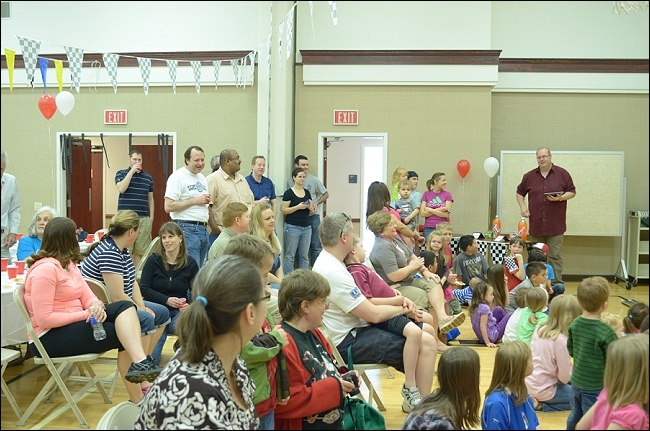 For the past few years we've put on an LDS Pioneer Day activity, but that takes place in July - outdoors. It's been hot, sweaty and we were relieved when it was over. I was not surprised when it seemed to be vetoed to continue for a 4th year! 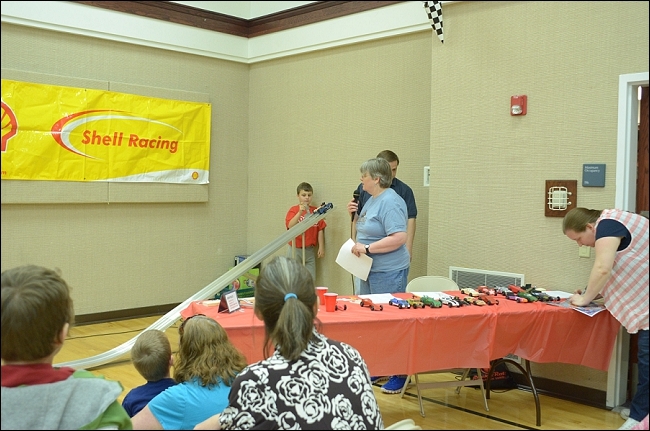 We came up with the idea to do a Family Pinewood Derby and I ran with it. I'd been designing the decor in my head for months. Unfortunately in my haste - trying to do all the shopping with 2 kids in tow on a hot day - I bought violet balloons instead of black, so my center pieces weren't exactly what I'd envisioned. Oh well! A few ideas had to be scrapped because of budgeting but as you can see below, I thought it came out pretty awesome! My Dad's car was a bit of a show off. It was so cute to see how much time he took designing his car. Unfortunately the scale at home vs. the scale at the event was different, but both our cars were able to race pending a few minor adjustments. Autumn and I made our car, a joint effort, we called "Tink's Low Rider". 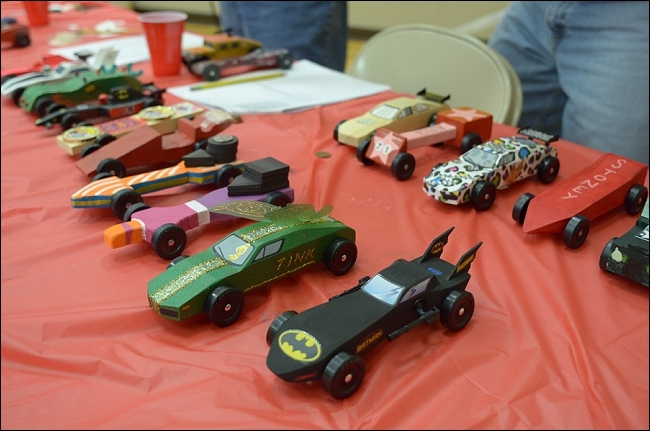 Obviously, as a girl, I've never made a pinewood derby car. I did a bit of research, but for the most part, we winged it. Literally - our car had wings. AND it was sparkly! We had a really great turn out! 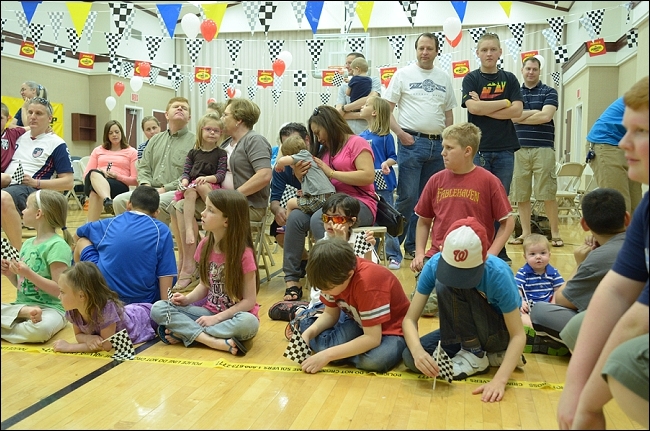 Our ward can be a little spotty with activity attendance, but we had about 21 cars race. I was so excited! 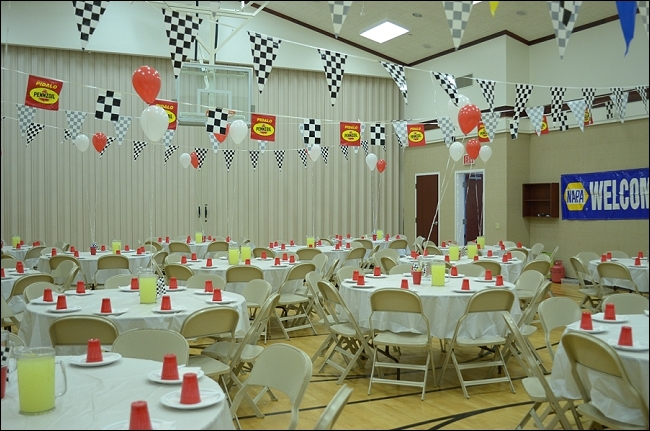 We had a pre-race brunch while we rocked out to some car themed tunes. It was hilarious picking out songs for the playlist with my mom - apparently car songs were more popular in the 50's and 60's, because she knew just about all of them and they brought back all kinds of memories for her. For prizes, we had "movie night" awards. First place was 2 bottles of soda, 3 Redbox movie rentals, candy, popcorn and a blanket. Perfect for a night on the couch with the family! Tink's Low Rider did AMAZING! We won 3/4 races. That one race cost us a place in the finals, but I was so happy with her performance since it was our first time! Autumn was so excited to see her car race. Dad's car won 3rd place! He dominated all but one of his races. Not a bad showing at all! It was a great activity. 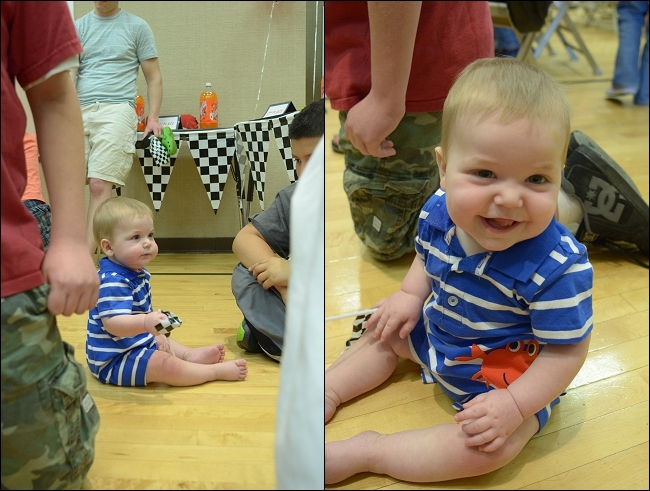 I had such great support to help me put together this activity. My presidency, friends in the ward and my husband, who strung all the banners across the cultural hall that you see in the pictures. Oh, he also took them down, so extra points to him! Love it! Looks like it turned out great...not that I would expect anything less with you in charge. =) Love the idea to do a ward derby, too! Where did you get the checker pendants? Our cub scouts are doing a pinewood Derby and I would like to decorate with pendants but have no idea where to find them.